New York-area pink fanatics rejoice! After the overwhelming sold-out success that welcomed 2,000 rosé wine lovers to the inaugural La Nuit en Rosé in 2014, the world’s first festival dedicated entirely to rosé wines and champagne returns to New York, June 25-27, on the Hornblower Infinity Yacht, sailing the Hudson River. – Opening Night Gala Dinner where a four-course feast, presented by The Wine Enthusiast, will be paired with the rosé wines of Château d’Esclans, while cruising around Manhattan. – VIP Lounge where a line-up of stellar chefs will prepare small dishes to pair with a selection of top rosé wines and Champagne cuvées (only available on the VIP Lounge). Featured chefs and restaurants will include Chef Laurent Kalkotour of Atrium Dumbo, the culinary team at Fig & Olive, Chefs Keavy Blueher and Allison Kave of Butter & Scotch, Chef Natacha Supplice of I Can Cook. The VIP Lounge will also feature an Oyster Bar and a Bubble & Truffle Bar presented by Ferrari and Urbani Truffles. Renowned sommeliers will guide you through the different pairing experiences. Seating will be available in the VIP lounge. – Pink Cocktail Lounge where mixologists will create pink cocktails for you to sip while enjoying views of the lit-up Manhattan skyline. – A bigger yacht, 2-hour cruises per event, food included in your ticket, more DJs, more dancing and guest entertainers! 8-10pm: Four-Course Rosé Wine Pairing Dinner, hosted on the third deck, presented by The Wine Enthusiast and featuring a two-hour cruise. 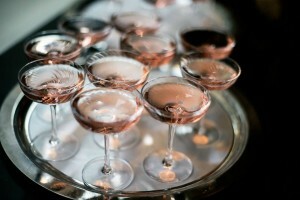 Upon your arrival, you will be greeted with a cup of rosé Champagne paired with Calvisius caviar. Dinner will start at 8:30pm and will feature four rosé wines from Provence from Château d’Esclans and sommelier AJ Ojeda-Pons to present the wines. $250 per person – Priority boarding from 6pm until 7:30pm. 7-10pm: Wine Tasting event with access to over 100 rosé wines, light buffet, two-hour cruise, and entertainment. $75 per person – Boarding at 7pm. VIP tickets provide early entry and access to VIP Lounge. $125 per person – Boarding at 6pm. General Admission tickets include access to over 100 rosé wines, light buffet, two-hour cruise, and entertainment. $125 per person – Boarding at 12pm. $75 per person – Boarding at 1pm. DRESS CODE: SUMMER CLOTHES WITH A PINK DETAIL!